Wall, floor, and ceiling mounted bath lifts (aka bath hoists) are all designed to mechanically assist you with getting into and out of the tub. They are powered by either rechargeable batteries or electric power. At the mere push of a button, the lift acts to lower you to the bottom of tub and, when you are finished bathing, raises you back up again. Commonalities: What do these 3 lifts have in common? Differences: How are these 3 lifts different? The primary difference between these three types of lifts is where they are mounted: wall, floor, or ceiling. Further differences can be found in the bath lift’s seat type, weight capacity, reclining capabilities, and whether or not the lift can be used independently, or requires a caregiver’s assistance. The following information will help you in determining which type of lift is best suited for your needs. Mounts on the floor next to the tub. User must be 350 lbs or less. Designed to be used independently. User must be able to sit down and stand up from the seat. 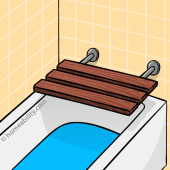 Stable seat for transporting a bather in and out of the tub. The backrest remains fixed in an upright position. Once a bather is lowered to the bottom of the tub, it is not possible to recline back. If your bathroom is small, the pedestal base attached to the floor may impede the path of travel for a wheelchair or walker. Does not work with all bathtubs. Confirm with the manufacturer that it will clear the height and width of your tub’s wall. Mounts on the wall. Some wall mounted lifts are designed to remain permanently fixed in one location, others include a bracket that remains fixed in place on the wall and a lifting mechanism (lifting arm) that is removable, making it possible to use the lift for transfers in other places (i.e., bedroom or car transfers). Most models will support up to 300 lbs. Some models can support up to 350 lbs. Most models have a cloth, sling-style seat. Some have a solid plastic seat. Models with a hard plastic seat can be used independently. 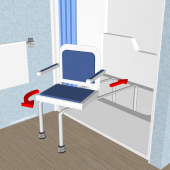 Most users of lifts with sling-style seats will require a caregiver’s assistance in order guide the sling over the tub wall. 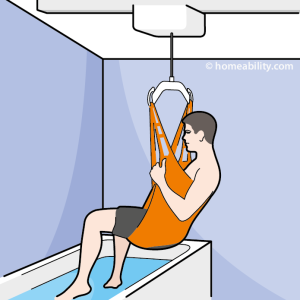 Some users may be able to pull themselves (while suspended in the sling) over the tub wall by using a grab bar attached to a nearby wall. A lift that is attached to the wall does not occupy any valuable floor space or prevent other family members from using the tub. It may require installation of additional support (aka “blocking”) inside the bathroom walls. Mounts directly to a track on the ceiling or to a free-standing support frame that straddles the tub. Some models are capable of lifting up to 1000 lbs. Most models are designed to be used with a sturdy cloth sling that supports the users body. Some models have a unique stainless steel support system with pads that grip the user on either side of the rib cage and supports for the user’s thighs. Both types allow a user to be lowered all the way to the bottom of the tub for a fully submerged bathing experience. Most ceiling lifts are only designed to assist a user to move down to the bottom of the tub and back up again, but are not designed to assist a user to move laterally over the tub wall. The majority of users will require a caregiver’s assistance in order guide the sling over the tub wall, however, some users may be able to pull themselves (while suspended in the sling) over the tub wall by grabbing a grab bar that is attached to a nearby wall. For those users who want to be independent, but who cannot manually guide themselves over the tub wall, there are some more expensive, specialized ceiling lifts available that can also mechanically assist a user to move laterally over the tub wall. A lift that is attached directly to the ceiling does not occupy any valuable floor space or prevent other family members from using the tub. “If” the ceiling lift is attached to a support frame that straddles the tub (and not directly to the ceiling), it will have at least two stabilizing support poles that will rest on the floor outside the tub. If the bathroom is small, these support poles may impede the path of travel for a walker or wheelchair. Which Type of Bath Lift is Best for a Person Who Can Walk? If you are someone who can walk, and want a solution that will allow you to get in and out of the tub independently, then the wall or floor mounted lifts with a sturdy plastic seat and a backrest are a good consideration. A notable drawback for these types of lifts, however, is that the backrest is fixed in place so you won’t be able to recline once you have lowered down into the tub. If you want to be able to recline while soaking and your balance skills are sufficient, another alternative you may want to consider is a portable bath lift with a reclining backrest that will allow you to relax in a semi-reclined position while you are soaking. Which Type of Bath Lift is Best for a Person Who Uses a Wheelchair? If you rely on a wheelchair now, or expect to rely on one in the future, then a wall or ceiling-mounted lift with a sling-style seat is a good consideration. 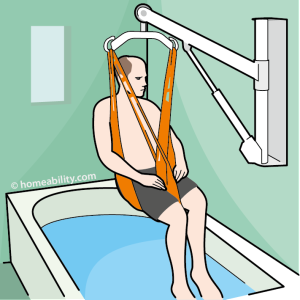 The advantage of a lift with a sling-style seat is 2 fold: it reduces the number of physical transfers required to get in and out of the bathtub because it is designed to lift you up directly from the wheelchair seat, and it will allow you to take a fully submerged bath seated on the bottom of the tub. 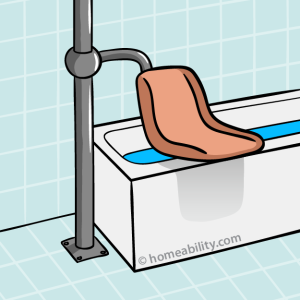 “If” you have a progressive disease and anticipate needing to use a wheelchair in the future, but aren’t using one now, in the interim you can place a standard chair beside the bathtub. Place the sling on top of the chair and sit down on top of it. Once seated, hook the sling to the motor above, push the button to raise yourself up from the chair, and guide yourself independently, or with the assist of a caregiver, over the tub wall. These types of lifts can sound expensive upfront, ranging on average from $4,000 – $15,000+ installed. However, if you anticipate using the lift for several years, the one-time upfront investment has potential to save you thousands over the years ahead. A permanently installed bath lift can result in money savings by helping to eliminate the ongoing expense (as well as the hassle) of continually setting up a schedule with a caregiver to come to the home and assist with bathing. It can also reduce the likelihood of needing to move to an expensive care facility that can cost $4000 -$10,000 /month. 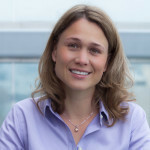 The “potential” for cost-savings needs to be evaluated on a case-by-case basis and can vary greatly based on the individual situation. When doing a cost-analysis, it is important to also factor in that these lifts are mechanical devices, so they will require periodic tune ups and repairs over the years. 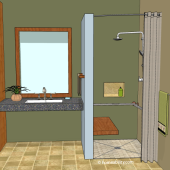 This guide specifically covers bath lifts that are permanently installed in the bathroom. Portable-style bath lifts also exist. To learn more about those, visit our Bath Chair Lift Guide: The Basics. If you are unsure which type of bath lift is most suitable for your physical needs, hire a local Occupational Therapist to perform an onsite assessment and assist you in determining which lift is right for your physical needs and the space allotted. It is also advisable to consult with a local contractor about which lift options can be appropriately paired with the architectural features inside your bathroom.